When played in real life, keno holds a higher house edge in comparison to many other casino games, but the online version (where Internet gambling sites have less overheads to worry about and more room for player-friendly rules) gives players superior odds, more lenient betting options and a much wider variety of game variations. We explore the history of keno, how to play, and unveil the best real money keno sites for online players. Keno is a luck based game, where there’s absolutely nothing a player can do to influence the outcome of the winning picks that are drawn. But it is exactly that poor player advantage, or lack thereof, that can make it one of the most exciting gambling games around, featuring potentially huge payouts for those gamblers that are willing to make the big risks and throw caution to the wind. Keno is gaining a large online presence as its popularity rises; in fact, online keno is one of the most popular games on the market, as it is featured on mobile apps, a plethora of casino websites and in video form. In this great digital information age, the game of keno has been ushered in with it, and it remains a large part of the online gambling industry. Our recommended casinos in the table above also provide the option of playing online keno games for free in practice mode, so you can give games a go without any risk to your wallet. The game of keno dates back thousands of years, and most scholars believe that its roots lie in ancient Asia, or China, to be more specific, even though the etymology of the word keno traces its origins back to French or Latin roots. It is most likely a product of the Han Dynasty in China. During the time of the Cheung Leung’s Han Dynasty, war was all around. Leung had already taxed his people to exhaustion, and legend says that it was out of the need for more money to fight the wars being waged all around him, he invented the game of keno. It started out (and really still is today) as a lottery, and its purpose was to raise money for the Han Dynasty wars. Legend also states that funds gotten from the game of keno were also used to help fund the building of the Great Wall of China. This is, of course, all stipulation and fun speculation, as there is no record of a Chinese lottery until the nineteenth century. 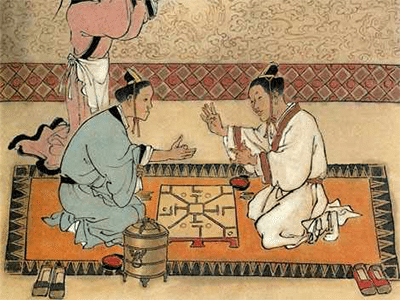 But ancient versions of the game of keno featured 120 Chinese characters instead of the modern usage of 80 numbers, and in China, keno is still played with Chinese characters rather than numbers, though the number of characters has been reduced to 80 in accordance with global continuity. In the United States, the game was wildly popular right off the bat when it was brought to the country via Chinese sailors (one important note: depending on the information, keno either came from sailors or Chinese immigrants who came to America to work in the mines and the railroads, and most likely the answer is a combination of the two) in the early twentieth century. More specifically, keno got its start in America in San Francisco. It was also during this time that the common Chinese characters were switched to numbers to accommodate American players. While gambling was legal in the state of Nevada during the time of the early twentieth century, lotteries were still criminalized, so to get around this, casinos started calling the game “Racehorse Keno” to cloak it in the veil of a racing game rather than a lottery. So quite literally, the 80 numbers on a keno card were designated to different horses, and each game of keno was in fact called a race. Eventually, lotteries were legalised in the United States, so casinos started calling the game keno once more. In an interesting bit of trivia, the game of racehorse keno is still played today with the same rules it employed during its infancy that were implemented to disguise the actual game of keno. Anyone curious on the number superstitions and patterns involved with picking keno numbers should have a read of our luckiest keno numbers article and decide for themselves if certain picks are better than others. 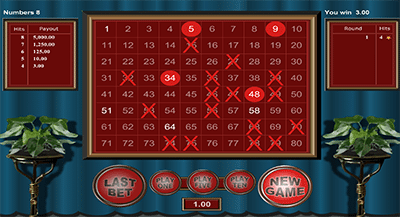 Keno is a game that has the potential to give huge payouts to relatively small bets. It is usually played in casino lounges, pubs or newsagencies (or in the case of online keno, in front of the computer or phone screen), and there will usually be monitors laden throughout the venue that display the winning keno numbers. Video versions of the game feature computer monitors in which the player will insert tokens or coins into a slot in order to play. Whether playing online or in a land based venue, the rules and game format is the same. The only difference is the way you place your bets. In real life, you must mark your keno picks on a physical ticket, whereas online this is done with the point and click function of your mouse, or touch screen function of your mobile device. In order to play keno, you must choose a minimum of four up to a maximum of 20 numbers that range from one to 80. Each choice is termed a “spot.” Therefore, if you select seven numbers, then you are playing a seven spot game. If you select four numbers, then you are playing a four spot game, and so on. When playing keno in a casino or pub, there will be blank keno tickets throughout the venue that you can pick up in order to mark your bets and then give your marked ticket to the person at the keno desk, along with your wager. If playing at a news agency or petrol station, just hand your ticket to the cashier at the counter. The clerk will then present you with a duplicate ticket. Shortly after that, a drawing of 20 keno balls will commence. These balls are drawn at random from 80 numbered balls in a barrel or blow machine. You are a winner if you match a given number of your selections to the 20 numbered balls that were drawn randomly. 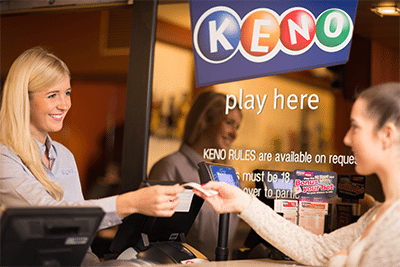 In Australian land based keno venues, the minimum bet to play keno is usually $1 or more, but this can be even more affordable when playing online. Payouts are determined by the kind of ticket you play and the amount of numbers you match. One of the things that makes keno so exciting is that it is possible (albeit extremely rare) to win $50,000 on only a one dollar bet. And these are just a few of the reasons why keno is so popular, both in real life and at online casinos. Check out some of the best keno games online which are playable for free or real money at Raging Bull Casino, our top-rated casino site for players from United States. There’s an excellent welcome bonus available for new players, plus plenty of other luck-based casino games to choose from.